On the heels of a 5-3 loss Wednesday night that took almost eight hours to complete, it was evident that the bleary-eyed Red Sox were still dragging their heels yesterday. 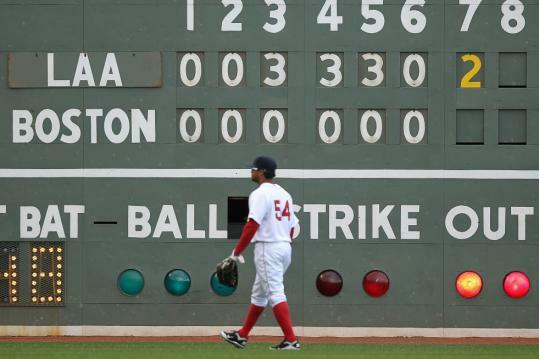 The players reported back to work at Fenway Park eight hours after Wednesday night’s game ended at 2:45 a.m. yesterday and were in dire need of an energy boost that was not likely to be found in an over-the-counter five-hour energy drink. “Last night was rough on our guys,’’ said Lackey, who was hoping to extend his mastery of his former team to 5-0. “I definitely think there was a sense of me needing to pitch well to get some momentum going, for sure. If I had pitched better early on, I think the guys might’ve found a little more energy early on for sure. The Angels, who snapped a six-game losing streak against the Sox with the marathon win, snapped the four-game skid against their former righthander with an 11-0 shutout of the Sox yesterday, roughing up Lackey for eight runs on 10 hits over four innings. “Obviously a tough day,’’ said manager Terry Francona, whose team was shut out for the fourth time this season and was outhit, 18-7. “Came out of the bullpen and [pitching coach] Curt [Young] felt like everything was down. The depth of the pitches are what we talk about, and he got to about the third inning and nicked [Peter] Bourjos with an 0-and-2 pitch, and then everything kind of started to flatten out a little bit and stay in the middle. Lackey gave up three runs in each of the third and fourth innings before he was chased in the fifth by Mark Trumbo’s two-run homer, a rocket to the Green Monster seats that gave the Angels an 8-0 lead. The Sox, meanwhile, were unable to muster much against righthander Joel Pineiro, their former reliever, who went 5 2/3 innings to pick up his first win of the season. “Lack cares so much about not upholding himself, but this team,’’ said catcher Jarrod Saltalamacchia. “It doesn’t surprise me one bit that he felt that way. With a bullpen taxed by the night-into-day ordeal, the Sox called up lefthander Rich Hill and righthander Scott Atchison from Pawtucket and placed Bobby Jenks (right biceps tendinitis) and Dan Wheeler (left calf strain) on the 15-day disabled list. Atchison and Hill were both summoned from the bullpen yesterday, Atchison in the fifth after Lackey gave up the two-run shot to Trumbo. After getting Jeff Mathis to fly to right, Atchison encountered difficulty of his own. Bourjos hit a double to shallow center that eluded a diving Jed Lowrie, who rolled his left wrist on the play. Kevin Youkilis, covering second, wound up getting spiked on the hand by Bourjos. “Lot of bodies flying on that play,’’ said a concerned Francona, who was reassured when both players remained in the game. Bourjos, who wound up at third on the play, came home on Erick Aybar’s single. After Howard Kendrick singled to right, Lowrie made a leaping stab of Bobby Abreu’s line drive and doubled off Aybar at second to end the inning. Atchison gave up two more runs in the seventh on three hits, before handing it over the Hill with two outs in the eighth. Although David Ortiz went 3 for 3 (all singles to left), the Sox never had a runner advance past second. Lowrie hit a ground-rule double in the fifth, and after J.D. Drew (back in the lineup after a bout with vertigo kept him out of Wednesday’s marathon) walked, Saltalamacchia grounded into a 4-6-3 double play, one of four the Sox hit into. The Sox have been shut out in three of Lackey’s four losses this season by a combined score of 18-0. But the previous two were quality starts by Lackey. Asked about Lackey’s performance, Francona said, “You’re never disappointed in Lack. I’d never say that. What is, though, was Lackey’s inability to give his bleary-eyed teammates the boost they sorely needed. “I didn’t locate as well,’’ Lackey said. “I probably fell into a few patterns and they might’ve been sitting on a few things.